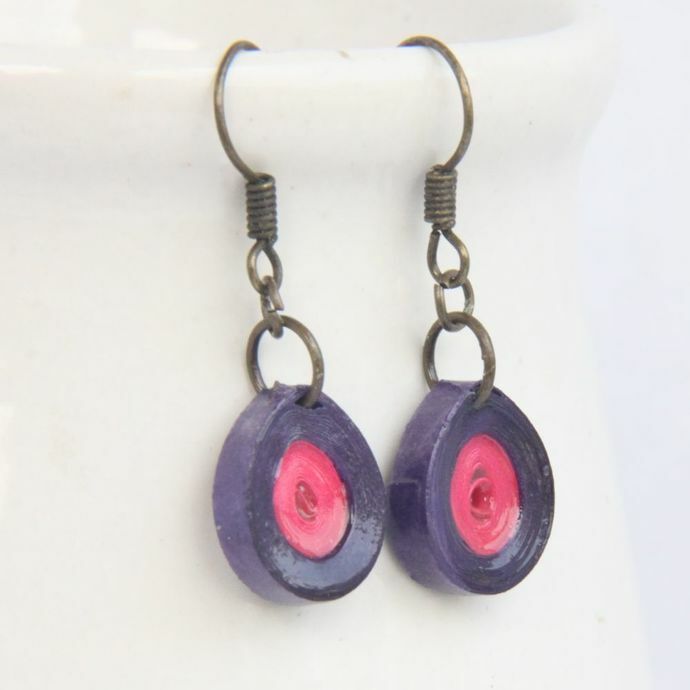 These adorable purple and dark pink teardrop earrings were made by my daughter, Svara, 9 years old. They are made with specialty quilling paper and sealed with eco friendly and water resisant sealant and topcoat to be water resistant. These cute earrings are finished with antique brass plated findings (lead free). They are approximately 3/8" (1cm) in diameter. Like the design, but not the color? Simply purchase this listing and let me know in the notes what color(s) you would like and Svara will make a special order just for you! This is a one of a kind design and cannot be replicated exactly, but yours will be very similar. Care Instructions: Care for your paper quilled jewelry as you would any fine jewelry. Keep it safe in a jewelry box or on an earring stand when not in use. They are water resistant, so rain won't hurt them. If they get wet, simply dab with a tissue. If they get very wet, dab with a tissue and lay out to dry. Do not wear while bathing or swimming.